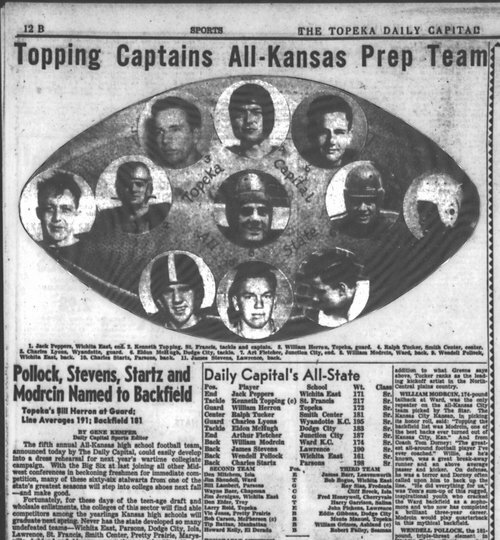 This newspaper article, from the Topeka Daily Capital, features the annual all prep team of outstanding high school football players in Kansas. The box lists the first, second and third teams. Kenneth Topping, a tackle from St. Francis, Kansas, was the captain. Others selected to the first team include Jack Peppers, Wichita East; William Herron, Topeka; Ralph Tucker, smith Center; Charles Lyons, Wyandotte K.C. ; Eldon McHugh, Dodge City; Arthur Fletcher, Junction City; William Modrein, Ward K.C. ; James Stevens, Lawrence; Wendell Pollock, Wichita East; and Charles Startz, Parsons. The entire newspaper page was not copied but it appears to include brief sketches of the first team players. "Topping Captains All-Kansas Prep Team"